Local search marketing can be especially challenging for businesses with multiple locations. Contributor Jason Decker explains how to do it right. Search marketing for a local business is tough — but those of us helping businesses with hundreds, sometimes thousands, of locations know it is a completely different ballgame. It’s a challenge to get one business in one location to rank, much less hundreds of locations spread across thousands of miles. This article is meant to serve as a guide for those performing enterprise local search. While many of the tips herein relate to any multi-location business, these tips are specifically tailored for enterprise-sized businesses and corporations with 50-1,000+ locations. When it comes to enterprise local search, it is critical to have a well-designed local landing page for every single location. The following best practices will help you dominate local search results. Title & Meta Tags. Be sure to use keyword optimized Title Tags that are unique to every single location. Include city, state and zip in your meta data. Have a unique meta Description for every page. NAP. Be sure to have your businesses Name, Address and Phone Number (NAP) in a very visible part of the page. Ensure that your NAP is consistent across the entire website (this includes details such as “St.” vs. “Street” and “CO” vs. “Colorado”). It is important to be totally consistent. Use structured data (Schema) to markup with the appropriate type of business. Google Local Map. Embed your business’s Google Local Map and not just a generic Google Map with your address. Photos. Use photos to differentiate your listing, increase engagement, and encourage interaction. Local landing pages with no photos generally have a much higher bounce rate. Use a storefront photo as well as interior photos if possible. For more professional businesses, show photos of the employees with a short biography. Videos are even better! Unique Local Content. A major challenge for many multi-location businesses is creating unique content for each and every local landing page. You often see identical content with only a few small changes. This is very spammy, bad for the search engines, and bad for your potential customers. You must create unique, very localized content for every single page. Be sure to list all products or services as well as hours of operation. Describe your city as well as your neighborhood. Mentioning nearby landmarks, parks, festivals or anything that makes your location unique is great! Be as specific as you can about your location. Mention your cross streets. Describe any public transportation nearby such as subways, bus routes, etc. Mention any awards or sponsored local businesses. Use badges that build trust such as BBB approved or industry specific badges. Optimized URL. Created optimized local landing page URLs that are easy for humans and search engines to understand. A good formula to follow would be www.website.com/city-state-zip. If you have multiple locations in the same ZIP code, use some kind of differentiator such as a neighborhood, landmark or even a store number. The formula could be www.website.com/city-state-zip-differentiator. If you create a unique page for every location and if you follow these best practices for local page content, this will build the foundation for local search success. In search engine optimization terms, a citation is a mention of your business name, address and phone number (NAP) on another webpage, even if there is no link to your website. An important factor in local search ranking algorithms is the number of citations, the accuracy and consistency of these listings, and how authoritative the website providing the citation is. 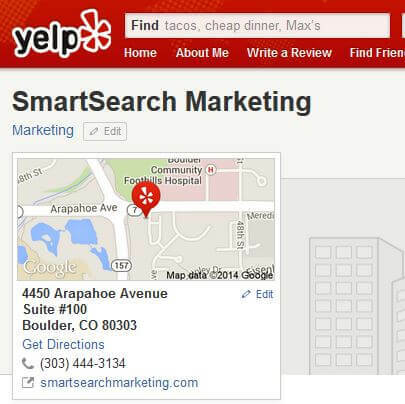 Submitting your site to local business directories such as Google+ Local, Yelp, Foursquare, etc., is therefore critical to building your local search presence. When creating your plan to build citations, I recommend that you start with data aggregators such as Acxiom, Localeze, Infogroup & Factual. Then focus on major local directories such as Google, Bing, Yahoo, Foursquare & Yelp. Moz also offers some great tools to determine the most important local businesses listings based on your industry or city. Once you have your list ranked in order of importance, it’s time to get started. Data aggregators can be expensive for marketers with many locations, but they are very important for local search. They are the fastest way to distribute local information for a large number of locations, as many local directory services get information directly from these sources (see the chart below). Use as many of these services as you can, as it will save you the trouble of having to submit individually to hundreds of local directories. If you are new to enterprise-level local marketing, you will be saddened to learn that many local directories do not allow for bulk uploading of data for multiple locations. That said, the following major local directory services do support bulk uploads for businesses with many locations, at no cost. Make sure you take advantage of this! Bing Local. Bing’s bulk upload process is much lengthier than Google’s, but it is a must, as well. Expect at least a month for the whole process to take place. Foursquare. The process is simple, and Foursquare has really stepped up its features lately. Foursquare has truly become a trusted source of local data. When you submit your business information to local directories and data aggregators, be sure that the business name, address and phone number (NAP) for each location is consistent with the way it’s presented on the site and on any local directories you may have already submitted to. As mentioned above, NAP consistency is incredibly important for local search visibility. It enables search engines to identify each individual listing scattered across the web as referring to a single business location, thus strengthening your citation count for any given location. This is an area that many businesses (especially large, multi-location businesses) ignore because it’s very time consuming and quite tedious work. For example, many local marketers review each directory listing individually to verify content, add new listings, clean up duplicates, etc. If you can afford it, there are some great tools that can help identify existing citations and clean up duplicates for you. These services are usually pretty expensive and may be a more cost-effective option for single location businesses, as the cost really starts to add up with multiple locations. A few of these services are Whitespark, Yext and a brand new tool from Moz called Moz Local. First, you should assess your current listings situation. There are a few free tools that will scan the web for your business and return information such as Name, Address, Phone Number inaccuracies, duplicates and more for a number of important listings. Moz Local offers a free tool for this, as does Yext. These tools are great time savers and a good place to get an idea of how much work needs to be done for each location. More than likely, you are going to find some inaccuracies that need to be fixed. For those doing it manually, search for each business location under each local directory. Where applicable, be sure to search a few different ways: by name (with variations), by phone number and ZIP. This way, you can determine if you are listed in a directory and find any duplicate listings at the same time. If you find duplicate listings for a single business, keep the most accurate listing and report the others as duplicates. Be sure to claim all local listings so you are the one managing them. Continue to build and clean up as many citations as possible for every location. While this is a very tedious and time-consuming part of the process, it cannot be ignored. It’s important to have as many local business listings as possible, and they absolutely need to be 100% accurate. Be sure to check back with any duplicates that you have found. Sometimes you will have to request to be deleted several times before they are removed. Start by creating a unique page for each individual business; utilize bulk uploads; distribute business information via data aggregators; optimize each business page using local search best practices; and build your citations. This proven approach will help you dominate local search results, build your brand online, drive local website traffic, and generate local business results.